(from Wikipedia, the free encyclopedia) The Alfa Romeo Spider (105/115 series) is a roadster produced by the Italian manufacturer Alfa Romeo from 1966 to 1993 (190 Spiders were badged as 1994 Commemorative Editions for the North American market). Widely regarded as a design classic, it remained in production for almost three decades with only minor aesthetic and mechanical changes. The three first series were assembled by Pininfarina in Grugliasco and the fourth series in San Giorgio Canavese. 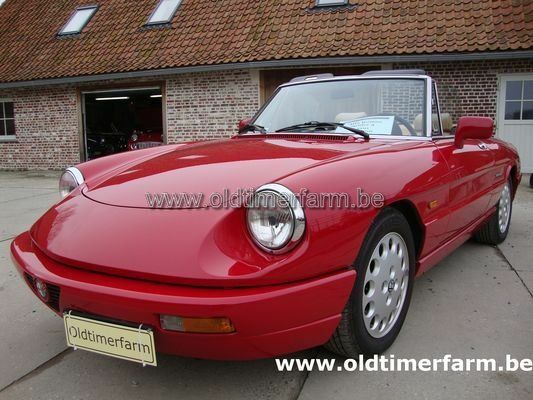 The last Spider was produced in April 1993, it was also the last rear wheel drive Alfa Romeo produced before Alfa Romeo 8C Competizione was introduced. The final major change to the Spider came in 1990. The primary mechanical change was that the Spider was given Bosch Motronic electronic fuel injection with an electric fan. Externally, the Spider lost its front under-bumper spoiler and the rear trunk-lid spoiler and picked up 164-style rear lights stretching across the width of the car as well as plastic bumpers the same color as the car. This also marked the first generation of this car with automatic transmission. In North America, the styling changes did not appear until the 1991 model year; 1990 models featured the Motronic fuel injection but retained the black bumpers. Power steering, larger knee bolsters and a driver-side airbag also appeared as standard for North American market Spiders, which were available in two configurations: Spider and Spider Veloce. Primary differences were in standard equipment: the Veloce substituted leather seats for the base model's vinyl; 15" alloy wheels were one size up from the standard steel wheels with hubcaps; and air conditioning and a cloth top were standard. 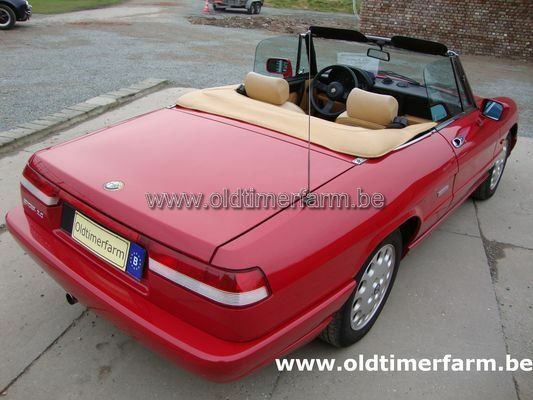 Production of the original Spider ended in 1993. An all-new Alfa Spider arrived one year later . Specifications. Body : length/width/height – cm (in) : 424/163/129 (166.9/64.2/50.8) Wheelbase : 225 cm (88.6 in); weight : 1110 kg (2516 lbs). Engine : front-mounted 4-cylinders 1962 cc (120 ci), 5 speed, manual; rear-wheel drive; power : 126 bhp @5800 rpm. Top speed : 190 km/h (118 mph).